This entry was posted in BandAid Race, Events, Fundraiser, News, Uncategorized on March 3, 2015 by David Schmidt. Pasta Dinner this Friday night! This entry was posted in BandAid Race, Events, Fundraiser, News on February 23, 2015 by David Schmidt. Run, Get Tired, Help the Band! 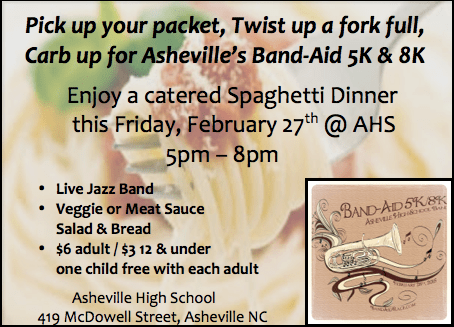 The 3rd Annual Band Aid Race, benefiting the Asheville High School Band, will begin and end on the beautiful campus of Asheville High. Join us for a great race, for a great a cause! All proceeds from the 2015 race will be used to help replace old, damaged and worn out instruments, as well as support scholarship funds for band members. Visit BandAideRace.com for more info. The race will begin and end on the campus of Asheville High School at 419 McDowell St., Asheville, NC 28803 at 10:00 am on February 28th. DONATE – Help us buy new instruments! This entry was posted in BandAid Race, Events, Fundraiser, News on January 12, 2015 by David Schmidt.